Built 1982 by Dravo Corp., Neville Island, PA. Copyright Photo by Tim & Lori Powell - Thanks, Tim & Lori! GM 16-645E7BA diesels, 6140 hp. Falk red. 4.345:1. Kort nozzles. 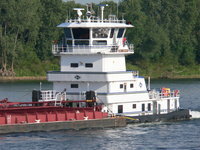 Owned by Ingram Barge Co., Nashville, TN.